For Palm Sunday (El Domingo de Ramos) vendors will be selling beautiful items made of hand woven palm fronds in front of all the main churches today. Some of the best are sold at the Oratorio. 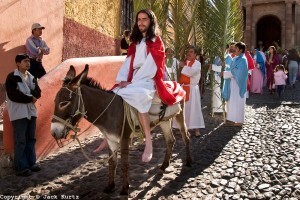 For over 20 years at around 10 am at the Calvario Chapel at the top of Calle San Francsico a young man in a rough white tunic (and a beard grown especially for the event) rides a donkey down the hill and through the streets of the centro. Behind him comes a joyful procession of the 12 apostles and dozens of other followers. Amid shouts of “Viva Cristo Rey,” the procession continues to the Church of San Francisco. After being met by the pealing of the bells, the group files in for mass. This same morning a procession leaves Parque Juarez. 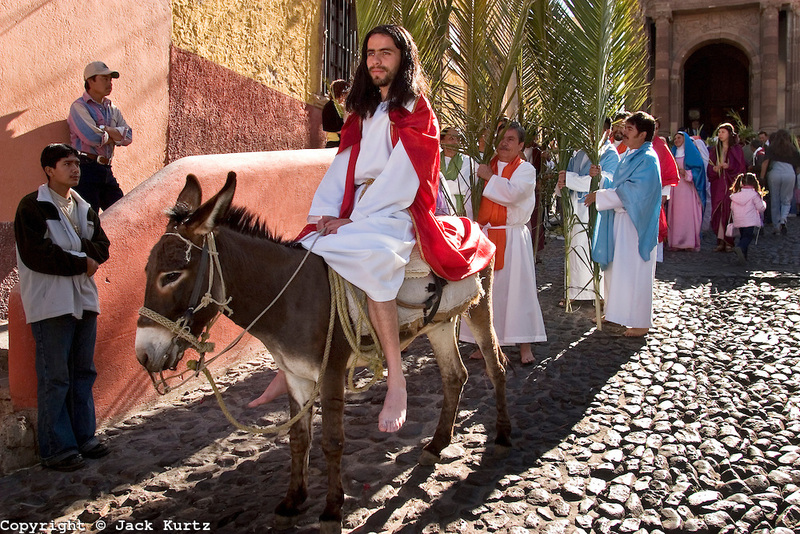 This time, Christ on the donkey is a medium-sized statue from the Santa Escuela Church, beside the Parroquia. Preceded by dancers in their bright regalia and trailing feathers and followed by hundreds of participants waving palm fronds, the procession circles back to the Jardín amid the sound of drums, trumpets and church bells.